Russia’s Festival of Landscape Objects saw a flotilla of seaworthy buildings float down the Ugra River to Nikola-Lenivets Village. Among the visionary houses was a beautifully-finished floating sauna, complete with a living tree on top by Finnish firm Rintala Eggertsson Architects. Five other architects participated in the Summer of 2008 floating festival, including Norman Foster and Sergey Skuratov. The homes took to the Ugra River and floated down on a kinetic architecture tour. The lucky crew of the Kaluga Sauna were treated to a full spa treatment on the way as a wood stove, dressing room, and sauna room were at their disposal. 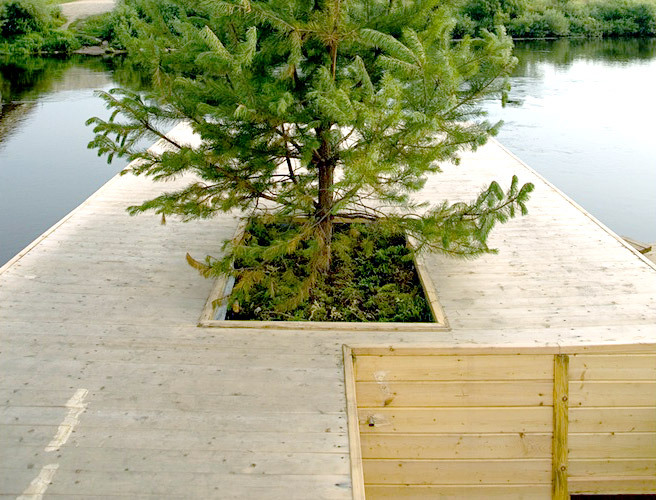 While perhaps a little gimmicky, the tree on the project’s roof expresses the sauna’s tradition of connecting humans with nature. The architects saw the event as a great way to let participants have a hot sauna and then take a plunge off the roof to refresh their senses. The houses are now set in Nikola-Lenivets Village, where they serve as a museum exhibit and guest housing. Floating, flood-proof buildings expand the possibilities for architectural expression, and we love that this one creates additional green space through its tree-top planter. Russia's Festival of Landscape Objects saw a flotilla of seaworthy buildings float down the Ugra River to Nikola-Lenivets Village. Among the visionary houses was a beautifully-finished floating sauna, complete with a living tree on top by Finnish firm Rintala Eggertsson Architects.